All the elephants have thick and dry skins. 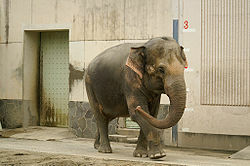 Asian elephants have small ears compared to African elephants. Asian elephant's mass is about 3000 to 5000kg and their length is almost same as the two beds. As people know, elephants have long noses, we call that nose a trunk. The trunk is used in many ways like they can lift up 600kg, and are used for bringing water and food. So that, food and water can be passed to the mouth by trunk. Also, elephants use it for fighting, breathing and protecting their babies. Usual trunks are 2 meter long, weight is around 100kg- 150kg. Even though elephants have thick skins, their skin can't protect the sunlight. So, they put some dirt on their back or make their backs wet. So that their temperature will be cool. Actually, Asian elephants don't have predators, but the problem is the young elephants might not be adapt the life in herd and they are so weak to grow up that's why they can't follow the herd. Elephants live as a group. People call that a 'herd.'. Usually, 15 to 20 elephants are in one herd. They are all relatives like uncles, aunts, mothers and daughters. The oldest female elephant leads the all members in herd. She leads them to find the food , find the place to rest, and water  and Herd is only the group of babies and female elephants. Asian elephants live with other elephants. differences between African and Asian Elephants Unknown. 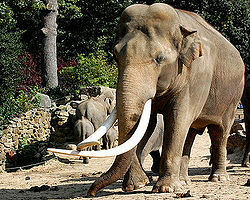 Elephas maximus Deborah Ciszek, 1999. Elephas maximus Unknown, Mar 3rd, 2006. Reproduction of elephant Deborah Ciszek, 1999. Danger of Asian elephant Wikipedia. This page was last modified on 29 October 2015, at 19:49.